Home Answering religious questions	At the time of reappearance, will Imam Mahdi force christians to become Muslims or he will give them freedom? 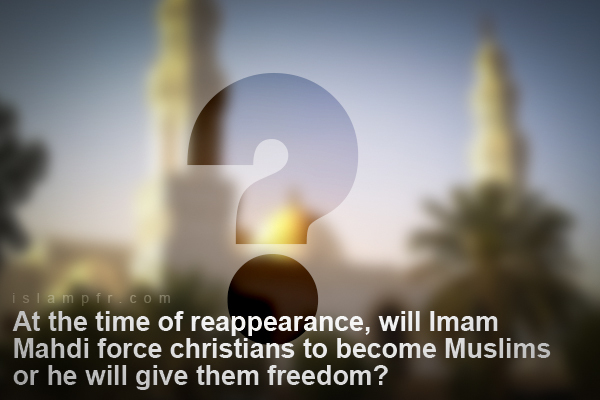 At the time of reappearance, will Imam Mahdi force christians to become Muslims or he will give them freedom? At the time of reappearance of Imam Mahdi (PBUH), if the people of a city like New York say that God has created us in this world with free will and we do not want to become Muslim, rather, as before, we want the freedom to prevail, everyone’s beliefs are respected and they should even be able to promote their beliefs freely; will Imam behave like ISIS towards them and force them to become Muslims or he will give them freedom? Narratives that speak of mass slaughter after the reappearance of Imam Mahdi (PBUH) are generally told by people who are not reliable. Rather, it is in contrast with some Qur’an verses and other hadiths that say Imam will respect the followers of other Abrahamic religions and rule over them according to their Holy book. But, the major battles and killings are against those who stand against the divine movement of the Imam of time and in any way hinder this blessed movement . Indeed, the main conflict is with the groups and organizations that disrupt the formation of Mahdist regime and implementation of its goals. On the other hand, many people who are not hostile to truth, after the emergence of the truth and the proof of the legitimacy of Islam, will become Muslims at their discretion and willingness; particularly the Christians who, with the descent of Jesus (PBUH) and his companionship with Imam Mahdi (A.J. ), will join the followers of Imam . Of course, it is not unlikely that all people are given complete freedom to promote their ideas because the fact that none of them can logically oppose the followers of Imam Mahdi (A.J.) will be the reason for the legitimacy of the true school of Islam in front of the eyes of the world. Accordingly, if some people, for whatever reason, do not feel the tendency towards Islam, but do not line up against it either and respect the rules of the Islamic government, will not be treated violently.